Everybody's giving away something all of the sudden. Never one to be left out, the gang at Room and Board are running a contest of their own. Room and Board asked Maxwell Gillingham-Ryan, founder of the blog Apartment Therapy to pick four of his favorite Room and Board pieces for small spaces. Now Room and Board is giving away one of those four pieces for each of the four weeks in April. Check out the details here and enter, you may end up with a Jasper sofa for crying out loud. 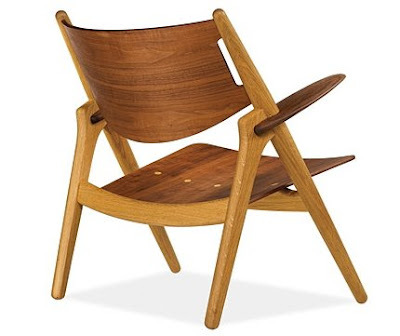 Unfortunately, the Sawbuck chair I'm showing at the head of this post is by Hans Wegner and it's not one of the prizes. Pooh. I love Wegner chairs above all others. Wow - I am headed over to enter! Have a great weekend Paul!